This past week was what we would call a good week for web videos. Going through all of the videos, it was hard to narrow it down since each page of the Daily Section brought more videos that turned out good as hell. This week there are 16 videos that turned out so good that I wanted to make sure you saw them or remembered you wanted to see it again. Let’s get into this hot mess of goodness. Not sure why this one took two months to be unlocked on Vimeo, but I’m glad it is. Check out Benn Pigot killing it for Tempered! “Just a few clips of Benn from before he broke his wrist, then he was riding again then injured his back now he’s riding again so this is pretty damn old and wasn’t released for reasons unbeknown to me. Filming is in progress for the Backbone DVD. 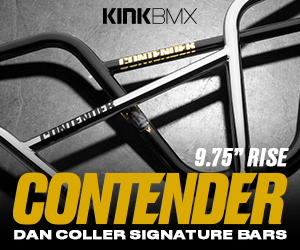 Here’s Tempered‘s latest ad featuring Benn Pigot and his new signature Datura bars. You can find more information about the bars right here! Here’s a look at Tempered‘s newest bars. The Datura’s are Benn Pigots signature bars that feature a custom extra large 13-butted tubing, 9 inches of of rise, 29″ width, 12.5-degrees of back sweep and 1.5-degrees of upsweep. The XL cross bar have unique bends and a base for maximum box space. These are available in Burgundy, black, raw and chrome. The Datura bars are currently shipping worldwide and should be available soon. Click here for more. Here’s a fresh one from Bull Mix featuring Benn Pigot, Lee Cruickshank, Pat O’neill and Mat Lawton. Take a look! Matty over at Tempered let me know the Tempered Canberra Roadtrip edits are now embedable. I figured since it turned out so well I’d do a repost with the videos embedded this time! Enjoy. Featuring Mike Vockenson, Jerry Vandervalk, Alex Liiv, Mat Lawton, Nick Kajewski, Benn Pigot, Raine Turnball, Jay Wilson and Jamie Mauri. Photos by John Young, Mat Lawton. Matty was telling me how good the Canberra trip went a few weeks back, and now the edits are finally up to see. It’s a bummer they aren’t embedable, but it’s whatever. Hit The Come Up to check it out. You won’t want to miss this one.